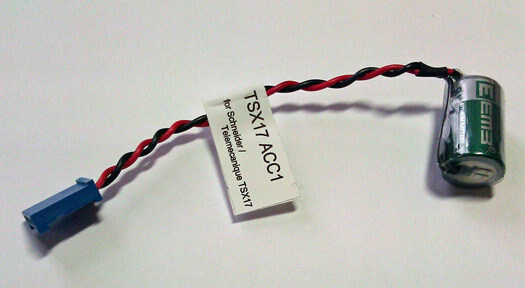 TSX17-ACC1 for Schneider Electric Telemechanique TSX17 and other controllers. TSX17-ACC1 Lithium Battery for Schneider Electric / Telemechanique TSX17 PLC. Replaces: Battery TSX17-ACC1 for Schneider Electric / Telemechanique TSX17 series controllers. PLC battery with plug for Schneider Electric / Telemechanique TSX17 PLC programmable logic controllers and industrial computers. It is a DIRECT replacement for the TSX17-ACC1 Lithium 3.0 V.
This TSX17-ACC1 Lithium PLC controller battery fits several Schneider Electric / Telemechanique TSX17 and other PLC controllers. It is a DIRECT replacement for the TSX17-ACC1 battery. Schneider Electric / Telemechanique TSX17-20. This Schneider Electric / TelemechaniqueTSX17-ACC1 PLC battery comes with a one year manufacturer's warranty.